This post was originally as a guest post for my sweet friend, Chelsea, over at Lost in Travels. As you know, in the month of February I'm highlighting some of my time in Korea. This post is a review of my time there. I hope you enjoy it. I had a lot of fun writing this and now reading it again. I decided to move to Korea for several reasons. Mainly I needed a change from my non-stop busy American life and I wanted a year away to refocus and re-prioritize my life. My friend Alisha mentioned that she was thinking about teaching in Korea and I asked her if I could join. We got all our paper work, stuffed and stuffed 4 suitcases and 2 very oversized large carry ons and off to Korea we went and WOW what a year it was. Alisha and I say it was the best year and the hardest year of our life. Our friend lent us some traditional Korean clothes called 'Hanboks'. When we wore them to school our kids told us we looked like 'grannys'. Apparently they are an outdated version. Our teaching job was real interesting. Honestly, when I left for Korea I forgot I was going to go teach. However, that didn't last long because when we arrived in Korea around 9pm and our school had us work the next morning. Hello jet lag! School was the "hardest" part of my year. Our school owners had us work from 9am - 6pm and that's a lot of teaching and wore me out. Ironically school was also one of the "best" things in Korea. I taught the beginners students who knew no English. It took a few months but I absolutely fell in love with those kids. Getting to know them personally, see them grow and develop is something I will always treasure. Another best part about school was that I got to tell the kids about Jesus. Some had never heard of anything Bible related and they were so curious. Another best part of Korea was my church. 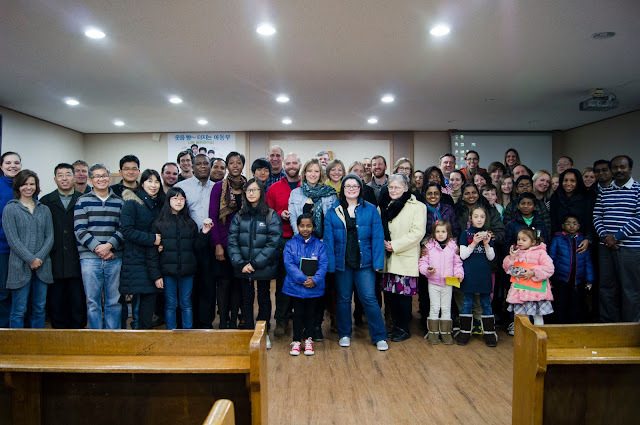 I attended Okpo Foreigners Church. It's an English speaking church, has about 30 members and has approximately 23 different languages / cultures represented. They were my family for a year and I met so many people from other countries but our common bond was our faith in Christ. I still cherish my time at OFC so much. Korea also is filled with wonderful people. 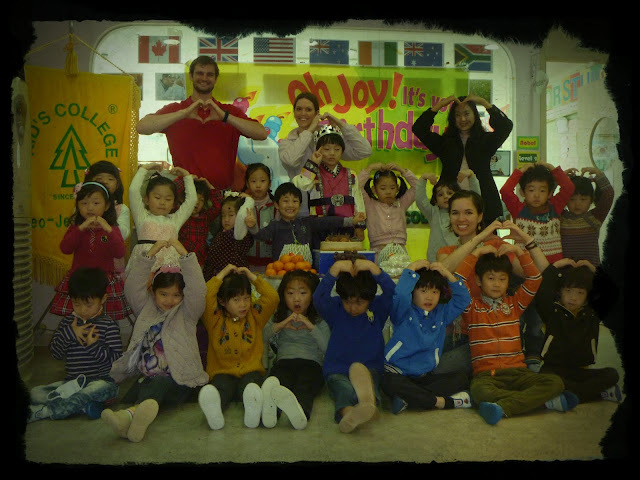 I absolutely loved building relationships through sign language, charades and broken English/Hangul. I learned that kindness and a smile goes a long ways. Pictured below is a sweet lady name DaiChu (Pronounced 'dye' as in hair 'dye' and chu as in I'm chugging a glass of water...hope that helps). DaiChu owned a teeny tiny cozy coffee house. We got to know her through sign language and severely broken English and Korean. However, one of the sweetest friendships was formed. Ever heard of long distance dating? Yep, I did that in Korea too. My boyfriend, Dave, was kind enough to let me leave for a year to learn and grow. During our time apart we wrote over 600+ emails, filled up 6 journals, had countless of hours of Skype, traveled together to Taiwan for a week and I flew home for Christmas. Was distance hard? You bet! Was it worth it? Yes! I got home February 6th and married Dave on March 24th: and I'm so glad I did! Coming back to America was major. reverse. culture. shock. I can't fully explain why but leaving the slower paced land of rice and kimchi to the fast paced land of pizza and burgers took some readjusting. Korea taught me that I could live without Walmart, that I could eat smaller portions, that I could walk and not drive and I enjoyed it all. I left America as one girl and came back as another and I couldn't be more grateful. So, that my friends, is a Korean review in summary. Do you have any questions about Korea? Questions about my time abroad? Let me know and I'll be happy to answer them. Loved reading this! 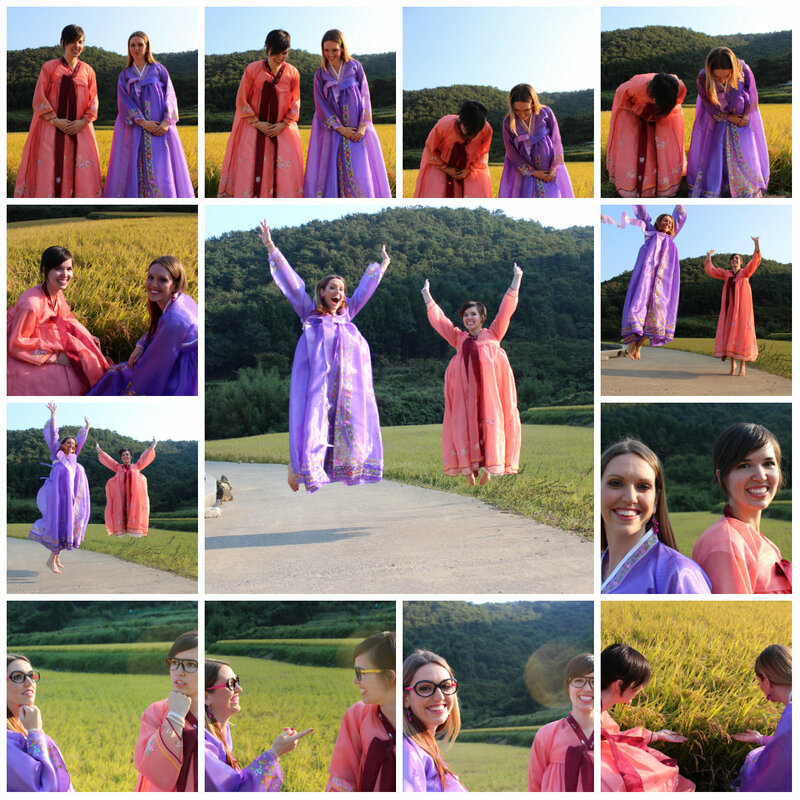 :) Fun to learn more about your time in Korea. I don't know how we will ever leave!!! Wow that is such a long working day! It is always so fun looking back and how great that you got to experience this with a good friend! Thanks! You will be able to leave when it's time. It is hard but doable. Long working day doesn't even begin to describe it =) My roommate and I were zombies by the end of the day. However, I wouldn't trade it for anything. One of the reasons I went was because I knew I would probably get married and I wanted to travel internationally before getting married. 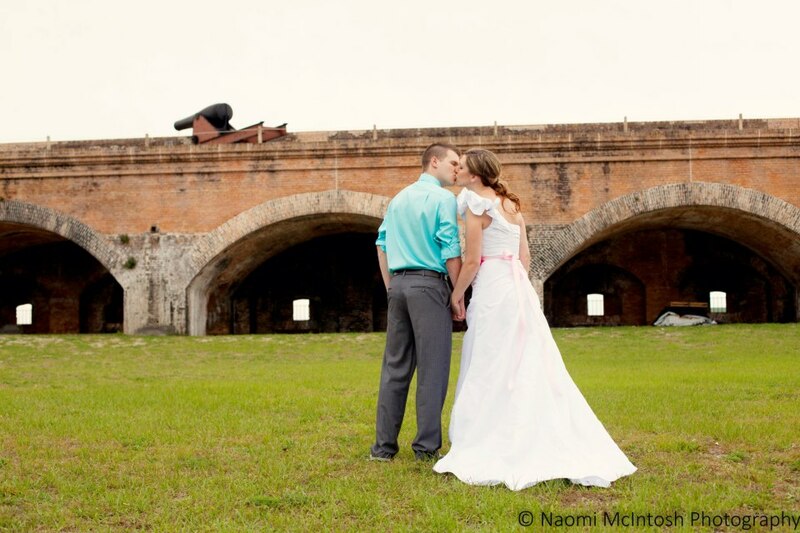 =) So many people told me to do something big and adventurous before marriage. I also needed time alone to do some healing from my past so it was really good for me / us. I'm sure Dave and I will still travel internationally but it was such a special year. My roommate and I are still really close friends and she is a great encouragement for my walk with Jesus. Thanks, Rachel! It for sure was life changing and very much needed. What an amazing year, Beka! I would love to live in Korea (land of my roots :) for an extended period of time and hopefully it happens sooner rather than later. I think living abroad is the best thing you can do for yourself because of all the experiences, challenges, and lessons you gain or work through. Sounds like an amazing trip. I hope to get the opportunity to travel abroad at some point. That would be awesome if you could live in Korea! Have you been to visit before? I agree living abroad is a life changer. I grew more in that year than I had in a long long time. I think it also gives me a different perspective on many things. I hope you do too! It's a great experience. That's so cool you traveled in Taiwan together! The traveling together was cool. Taiwan ... not so much =) I really need to write about that vacation and perhaps someday I should try again and visit there.